BEIJING, May 15 (Xinhua) -- He is known as the helmsman of the world's second-largest economy and chief of the largest political party as well as an ardent champion of globalization and an enthusiastic football fan. Now, Chinese President Xi Jinping appears to be reaffirming another international title as the architect of a grand plan to better connect countries along and beyond the ancient Silk Road. The Belt and Road Forum for International Cooperation held in Beijing on Sunday and Monday is a perfect illustration of China's rising international status and also, Xi's growing influence. 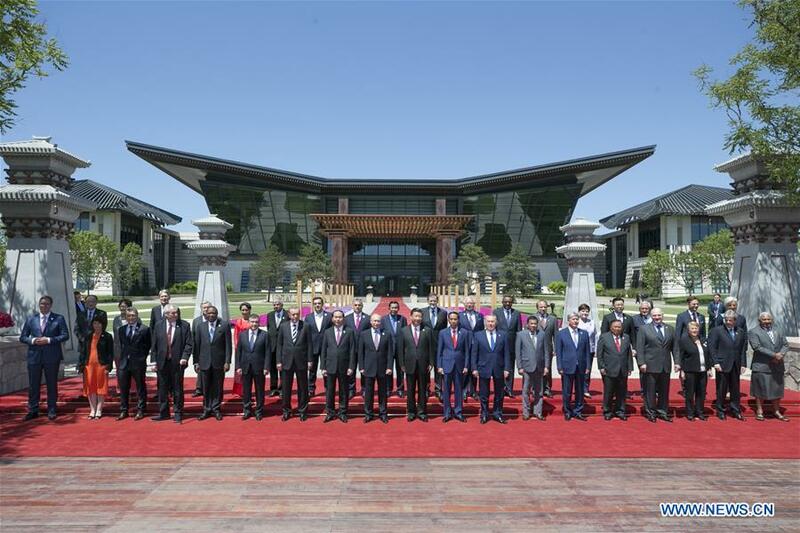 The images of Xi hosting 29 heads of state and government from across the world, as well as leaders of key international organizations, at the two-day forum bring back memories of eight months ago when the president chaired the G20 Summit in Hangzhou. All G20 economies were represented at the Belt and Road forum, which is attended by some 1,500 representatives from over 130 countries and over 70 international organizations. It is estimated that those countries account for more than two thirds of the global population and 90 percent of the world's total gross domestic product. By any standard, the forum -- covered by over 4,000 journalists -- is the most prestigious international gathering China has ever launched and one of the highest-level assemblies in the world. As China is preparing for the 2017 BRICS Summit in Xiamen in September, analysts say it has become increasingly clear that the past few years marked China's transition from a player in global affairs to a leader of the global agenda. Xi's stature as a responsible statesman has ascended in the process. He presided over the APEC Beijing meeting in 2014 and the G20 Hangzhou Summit last year, charting the course for global growth and navigating world economic recovery. In January, he defended globalization and free trade at the World Economic Forum in Davos, Switzerland against a new global reality that seems to be tilting toward protectionism. His strong domestic appeal, especially as the "core" of the Communist Party of China (CPC) and its Central Committee, has also helped project influence overseas. He is viewed as the avant-garde for reform and the Chinese Dream of national rejuvenation, and a staunch squasher of corruption. The Belt and Road forum in Beijing might bolster his influence further, both within China and beyond, especially with just a few months to go before the 19th CPC National Congress convenes in the second half of this year, at which new leadership will be elected. Addressing a roundtable summit of leaders Monday, Xi explained what had inspired him to come up with the Belt and Road Initiative nearly four years ago. The Belt and Road Initiative "does not exclude or target any party," Xi told the summit where he spoke of the myriad challenges the world faces: sluggish trade and investment, wobbling economic globalization, increasingly uneven development, impact from the massive flow of refugees and migrants, as well as wars, conflicts and terrorism. The words echoed a keynote speech he made a day earlier when he called the initiative a "project of the century" in a world "fraught with challenges." Only by coordinating national policies and integrating economic factors and development resources on a greater global scale can countries build synergy and promote world peace, stability and common development, Xi said Monday. Under these circumstances, the world has every reason to draw wisdom and strength from the ancient Silk Road, and advance cooperation in the Silk Road spirit of peace and cooperation, openness and inclusiveness, mutual learning and mutual benefit, he continued. "We need to seek win-win results through greater openness and cooperation, avoid fragmentation, refrain from setting inhibitive thresholds for cooperation or pursing exclusive arrangements, and reject protectionism," he said. "President Xi played a major role in bringing about all these positive changes by offering Chinese wisdom and solutions to the world and by dovetailing other countries' development strategies with the Belt and Road," said Wang Yiwei, professor at the School of International Studies at Renmin University of China. "The Belt and Road Initiative fits well with Xi's vision of a community of shared future for mankind. It is an important part of his governance theories, just like the concept of innovative, coordinated, green, open and shared development, and supply-side structural reform," he said. "Xi has shown he has what it takes to lead, not just in China, but also on the global stage, through the initiative," he said.